Software-defined storage startup SwiftStack took in a $16 million Series B investment round, which brings total funding to $23.6 million. Besides using some of the cash for sales and marketing, the company plans to improve its technology so that it can easily scale across multiple data centers, something SwiftStack CEO Joe Arnold said companies are calling for. SwiftStack’s core technology revolves around a custom software-based storage controller that links an organization’s existing storage hardware so that it can be used as one giant storage system. Just as a software-defined networking controller acts as the software brains that steer networking operations across a virtualized environment, SwiftStack’s storage controller takes on a similar role with storage in the data center. “What we have done is built a software-defined storage platform so people can use open-source software and hardware to build out private storage clouds,” said Arnold. Companies are moving from self-contained storage environments to a more distributed model, according to Arnold. With SwiftStack’s technology, companies can connect the storage infrastructure of multiple data centers even if they are located across different areas of the world. 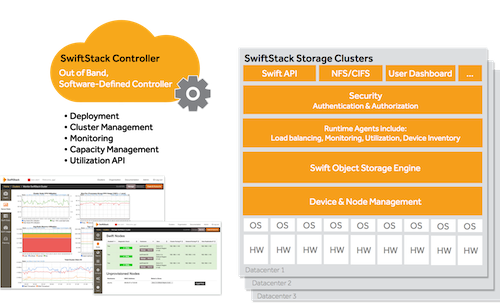 The [company]SwiftStack[/company] controller allows organizations to manage all that storage infrastructure, perform upgrades and perform other operational activities, he said. SwiftStack’s technology is built from the open-source OpenStack Swift object storage system but its storage controller is proprietary. This new funding round highlights how OpenStack-related tech companies are making a splash this fall either with big funding rounds from investors (Mirantis just nabbed $100 million and Blue Box took in $10 million) or getting acquired by legacy IT companies (EMC bought Cloudscaling and Cisco gobbled up Metacloud). OpenView Venture Partners drove the funding round along with previous investors Mayfield Fund, Storm Ventures and UMC Capital. OpenView’s operating partner Daniel Demmer will be joining SwiftStack’s board. Post and thumbnail images courtesy of Shutterstock user SasinT. It is great to see continued validation of OpenStack in the market. Anders, Joe, John, and the rest of the team at SwiftStack have built a really awesome product – it is so great to see them succeed with it.